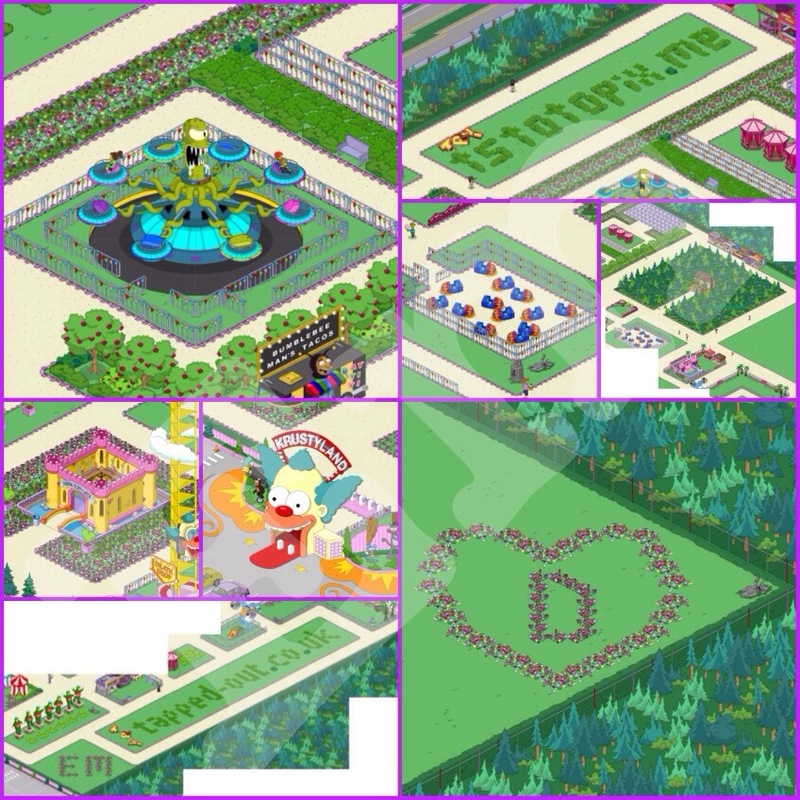 07/31/2014 07/31/2014 mickus3 Comments on Happy 1 year Anniversary Krustyland! Happy 1 year Anniversary Krustyland! Believe it or not but on this day, July the 31st (August 1st in the east), one year ago, Krustyland was first introduced to us. So let’s all say a wonderful happy birthday to Krustyland. The forgotten screen (well I forget to go half of the time and I’m sure you guys proberly do too) has now turned one so let’s celebrate by talking about different aspects of the themepark, including our writers’ personal opinions and aspirations (past, present and future) and their own favourite personal design in their own park (if they have one). So I’ll break it down into sections. Here are the sections. For those who don’t know what Krustyland is due to that they are either new to the game or even they decided to start it after Springfield is completed, Krustyland was introduced on July 31st 2013, at the beginning of the summer holidays (in the Northen hemisphere). Introducing a brand new currency and a brand new screen, at first slow and draining. Also, house farms or should I say shop farms aren’t included. EA’s personal feature, to prevent dirty Krustylands and clutter of just currency produces, was to make only the original of each building offer an income. This made the beginning more difficult and saving was considered a chore. 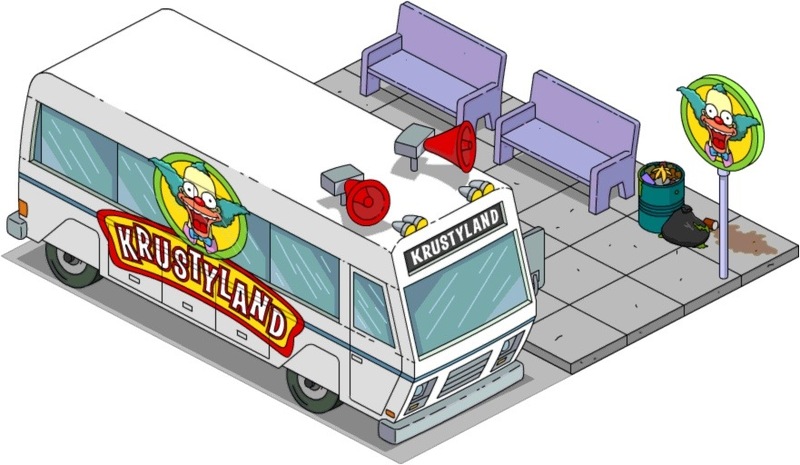 Krustyland is first introduced at level 20 after first saving $50,000 in order to buy the Krustyland shuttle. It will take 24 hours to build and Homer and Krusty will initiate the walk-through for Krustyland. Along the way, you will unlock certain characters to be able to visit after unlocking new buildings and rides. There is only one catch to Krustyland, as of yet you’re unable to put in rivers or lakes into the park. Unlock: level 20 and after placing the Krustyland shuttle. Characters: 1 main Character and 3 mascots (2 mascots are premium. Krustyland has its own Comfort-O-Meter called the Krust-O-Meter. It consists of four areas. You will receive five visitors for every overall star you produce and a maximum 30 visitors for a full five stars, adding extra income. 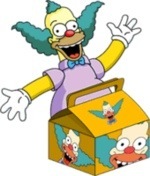 Krustyland also has its own mystery box called the Laffy meal in which, if you manage to get super lucky, you could win a great premium prize, however, I strongly advise against buying the Laffy meal because the odds are poor and you’re most likely going to get just tickets instead. It costs 25 donuts to buy. To see what you can win and the odds of what you can win click here. 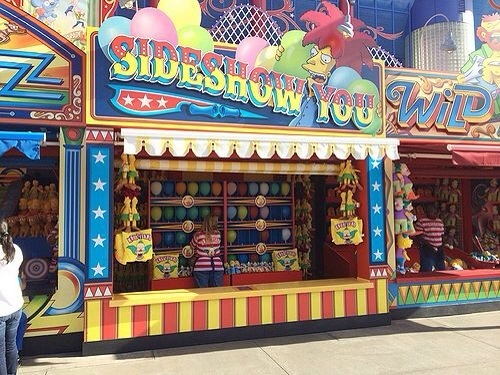 Krustyland has a a stall called Sideshow You. 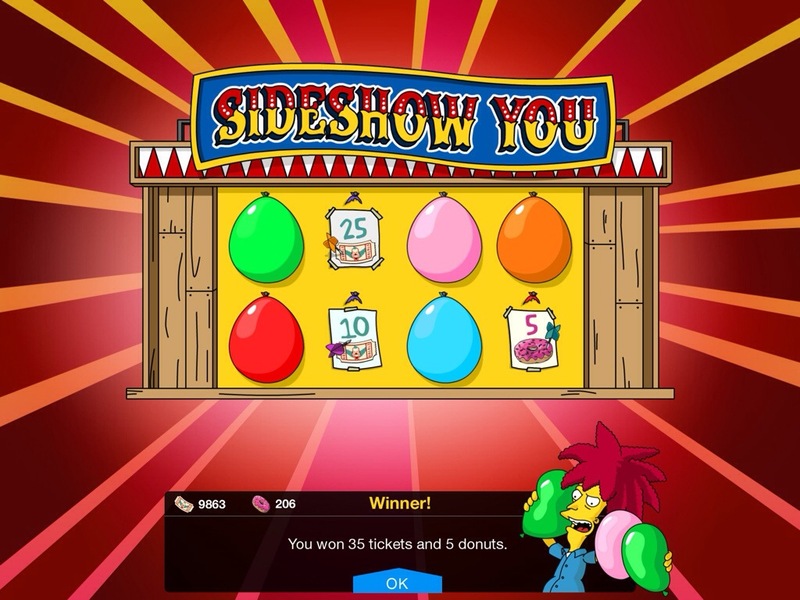 This stall has a mini game inside (similar to the scratch-its) which you can play, popping balloons to receive extra tickets with the slight chance of winning donuts. I wouldn’t get your hopes up though, it rarely happens. After you have played 100 times or popped 300 balloons, 5 donuts will be generated into the game like so. With the exception of the recent level 43, there has been very little added since its arrival last year however, we have seen 9 new decorations with both level 39 and 40, and three limited time rides through the Halloween 2013 event, Christmas 2013 event and Valentine’s Day 2014 event. Halloween brought us the introduction of the Twirl ‘N’ Hurl as a personal prize (based on the Universal Studios ride). Christmas saw the introduction of the Happy Little Elves in Pandaland ride as a personal prize (based on the Universal Studios ride). Valentine’s Day brought the addition of the Tunnel of Love, allowing Marge to enter (based on a carnival in another episode. Not originally from KL). It came with a price however, in order to win it you must have got at least one of each prize from the wheel of love (aka the wheel of hell). 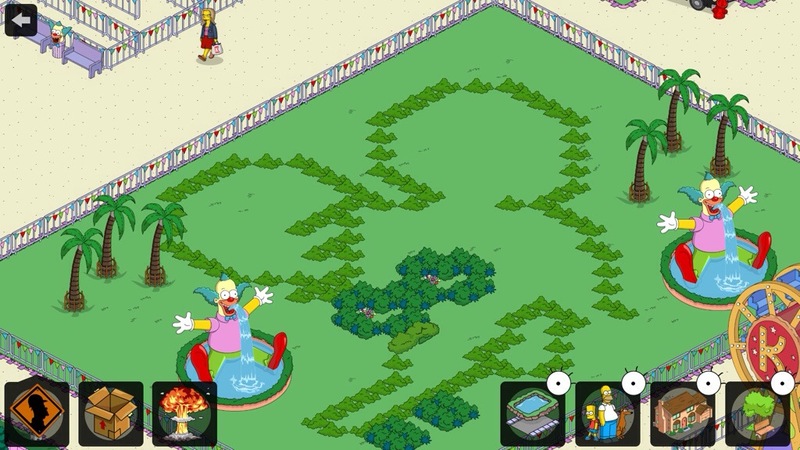 Shortly after Valentines finished and shortly before St. Patrick’s Day event began, EA added an update allowing all freemium decorations from the Valentine’s Day event into Krustyland to help liven up out boring Tunnel of Love designs. 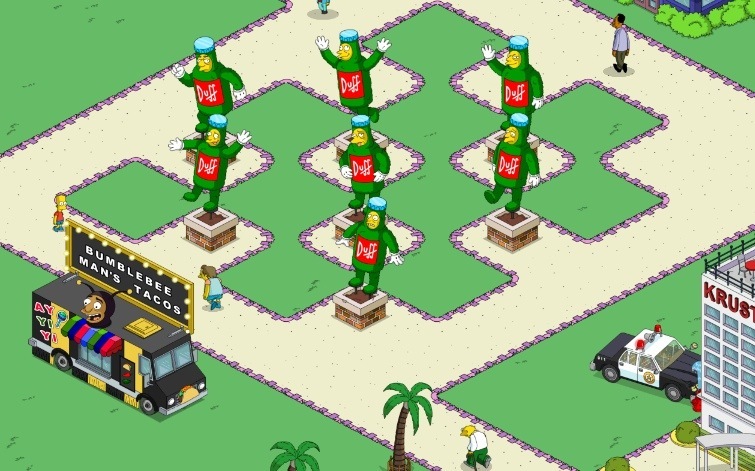 With the introduction of level 43, the first full Krustyland update since its release, came the ability to place all freemium only Easter event decorations. No premiums were allowed because they modify a different currency as the buildings of Springfield produce a different currency. 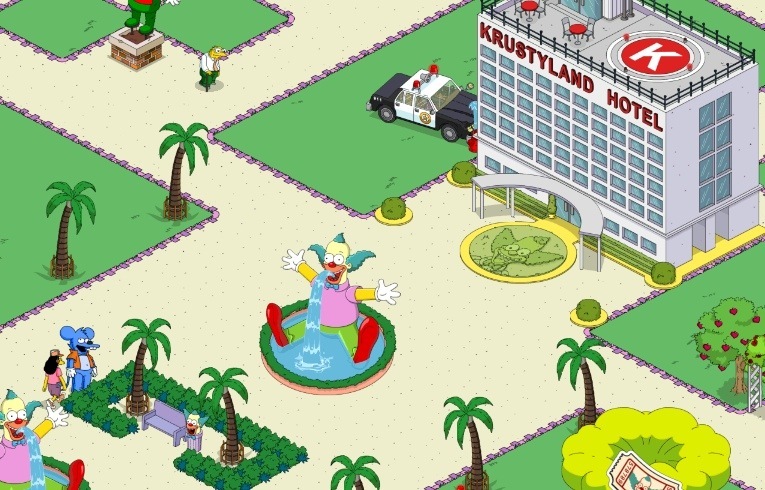 In total 22 characters can enter Krustyland (16 if you are freemium player). Marge is an additional character not included in my totals as she must have the tunnel of love to join them. Click here for the characters and requirements. The list is endless and EA have proven that by introducing items that exist in Universal Studios, or from other theme parks and episodes. 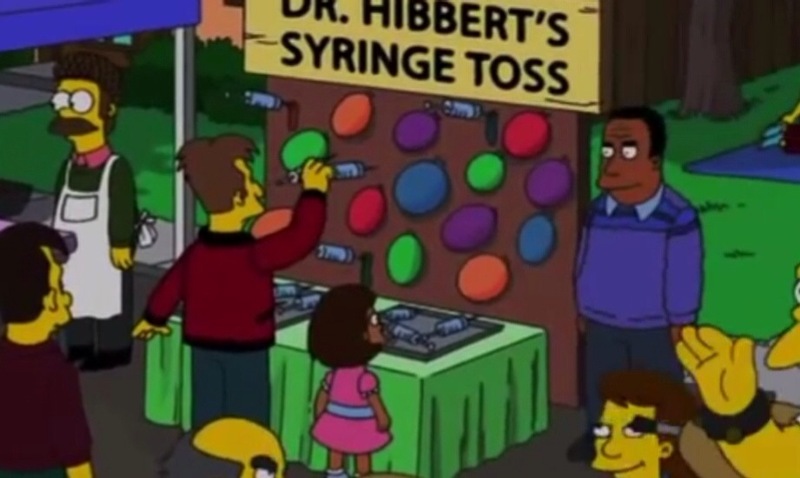 An example is Sideshow You, an attraction available at Universal Studios resembling Doctor Hibbert’s Syringe Toss. 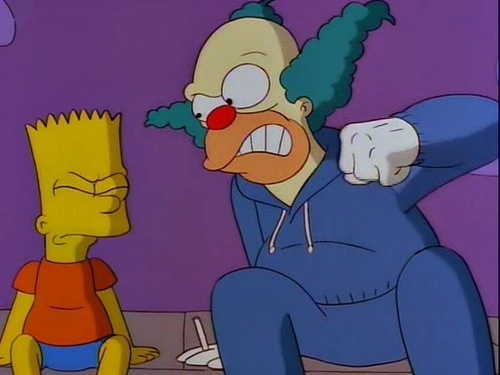 Note: the real Sideshow You picture was taken from wikisimpsons. There were several other rides and decorations such as the tunnel of love and the 7 duffs. There are huge expectations for more buildings and rides from other parks including Itchy and Scratchy land, Duff Gardens, Diz nee land, Mount Splashmore and Blockoland and Storytown village just to name a few. In addition there are still another 21 rides from the real life Krustyland in the Universal Studios which have potential of being added. When I think of theme park, I personally think water. An addition of a lake or a river would be nice to include, as well as a train ride where you could create the track. As for decorations, things like picnic tables, barbecues, icecream and drink stalls and toilets and general stuff that any normal theme park would have would be a nice addition too. Note: these opinions were written before the level 43 update and some items for the wish list may have already added. When we got the news that Krustyland was coming I was excited, like a kid on Christmas morning. At that point, I was experiencing a lull in the game and this boosted my interested again. Having access to the files I was able to see what was coming which actually made it more exciting. Not only was it new content but it was a totally new piece of land to start fresh with. The new currency was a welcome addition as well. My favorite part of Krustyland would have to be The Haunted Condo. I’ve always been a fan of haunted house rides and I like the imagery of this ride the most. Plus this ride was sort of a secret as you progressed through the quest and wasn’t initially in the menu. My thoughts to date on Krustyland: Since completing the initial quest I honestly have barely touched my Krustyland. Even though there are many characters that have tasks for it, I just have no interest in it like I thought I would. It’s nice that we have received a few random new rides with recent events and updates but we haven’t have a full-fledged new quest line since it’s initial release. 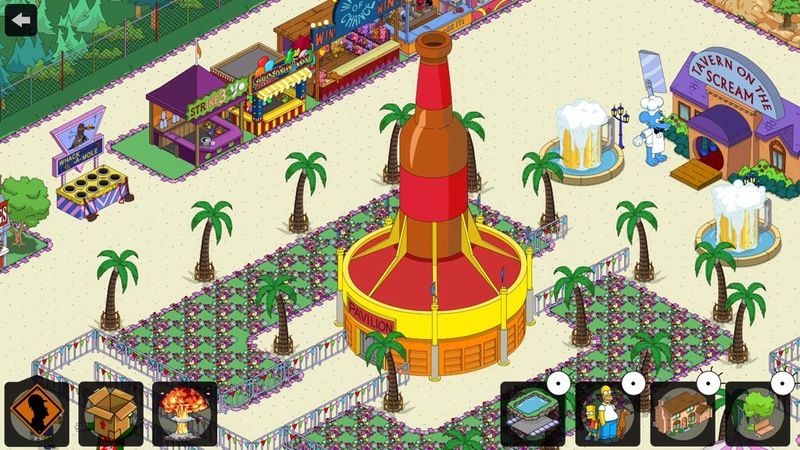 Anymore, the new content for Krustyland are strictly promotion for the Simpsons Park in Disney World in Florida. 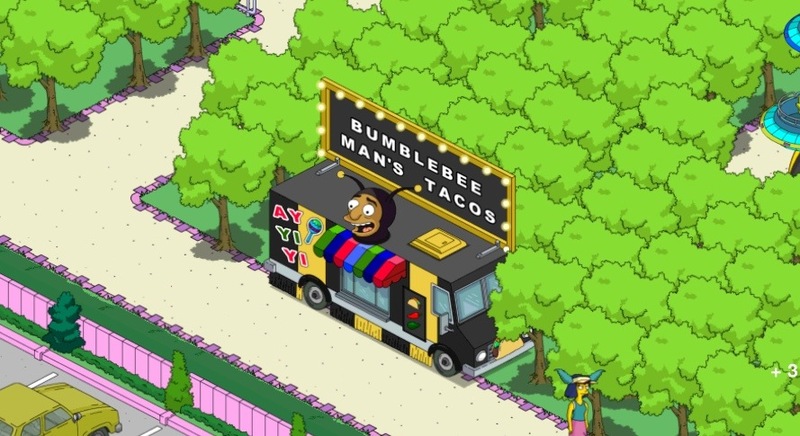 The Bumblebee Man Taco Stand and the Crashed Police Car have never appeared in the show and have only been seen in the theme park. 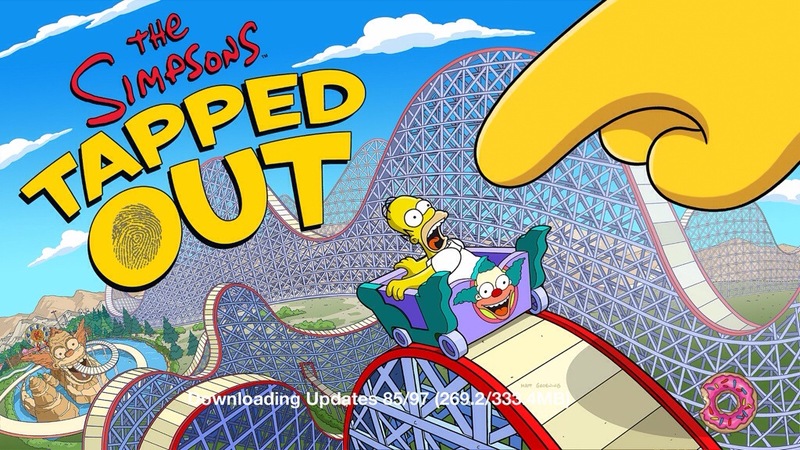 I like content from the show, the whole thrill for me playing Tapped Out is being able to have a connection with something that has appeared in the show at some point in its history. What would I like to see added to Krustyland? More rides, a new large update with another big quest line. It’s a Long, Long Line! I don’t have a particularly favorite single design but there are a few parts of my Krustyland that I am happy with. At first I found it exciting and enjoyable. It was so complex and so many questions were asked, it kept me on my toes to get through quests and answer all of the enquiries. Although tickets were hard to get, I enjoyed the extensive walkthrough. Also, the large amount of new content was great. The only problem for me was that it heavily consumed my time by collecting tickets for the quest line and designing. For now though, I find it very difficult to visit every day because my busy schedule and the amount of times it takes to load. To this day, I’m still saving tickets and I have never needed to convert tickets into cash because I don’t get time to visit every day so I can slowly save. I don’t even have all the land because my well spread park only takes 1/3 of the land and its fully designed for the time being. I have felt a little disappointed with the progress EA have made since its initial release. 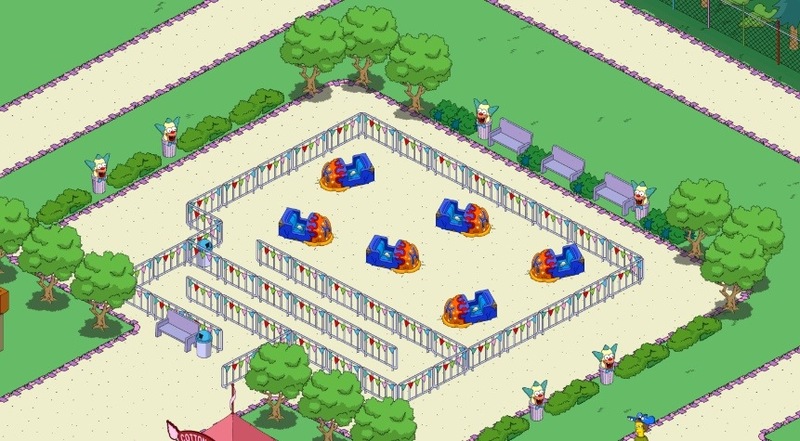 With only a few decorations, 3 rides in previous events and nothing from the 4th of July (a firework stand or display would have been nice), St Patrick’s Day, Easter or even the Stonecutters event, I have become immensely disappointed. With all of that land and so much potential, it just seems to be a pointless forgotten screen. That being said, I would love to see some sort of water feature maybe a lake or river. I would also like to see a train ride where we can design our own track. Think about it, whats the original story behind the game? Homer blows up Springfield and the giant finger in the sky must rebuild it in their own creative way. Different parallel dimensions. I would really like to see some freedom. I would like to see an update where you could implement your stored event buildings like the mausoleum or the Christmas Village, Blocko store, etc. i would like to add Sir Putt-A-Lots too and just like US (Universal Studios) Orlando and Florida, I want to move Krustylu studios and the Aztec Theatre over. Even if they were still to earn a cash income. I have two favourite designs. 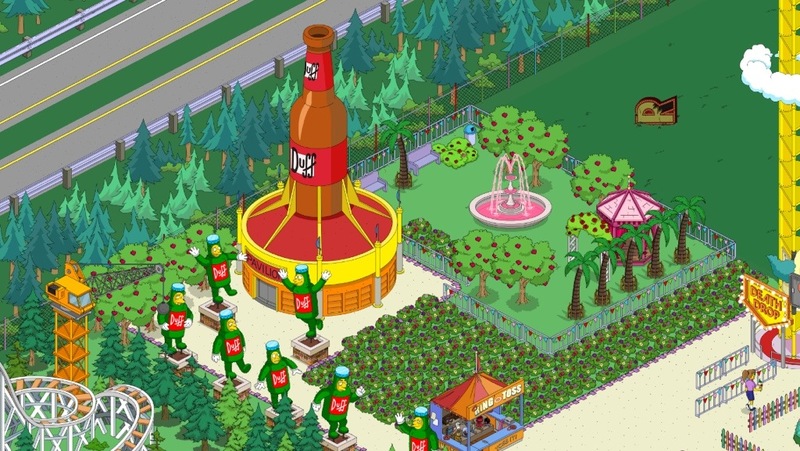 My Duff Beer Gardens and my Garden of Love. I also like my homemade dodgem cars (would love to see the stolen bumper carsin there too) however, sometimes simple is just as rewarding, Bumblebee Man’s Tacos and my Crashed Police Car both show off my Eco-friendly forest style theme park. Krustyland actually has my favourite designs, I’d just like EA to give a bit more of tender loving care towards it and the results would be endless. Still a work in progress though. Oh and by the way EA, can you give us a “u” and an “a” debris so I can finally spell out “Krusty” instead of Kr~~ty. Favorites: New area! Big expansion to the game! More stuff for characters to do! Really like that the ride animations activate often. Definitely excited from day 1 of its release. Cool rides and decos, thought the ticket system was interesting. Liked all the tasks for characters. A little disappointed that there hasn’t been more involvement with the main part of the game. We’ve gotten a couple of new rides, decos, etc, but there’s nothing to keep characters coming back to Krustyland. I only visit it because of Sideshow You and its donut earning potential. I’d like to see more tasks for characters and keep them involved in the game. More stuff to fill up all of that land! I don’t have a favorite design. 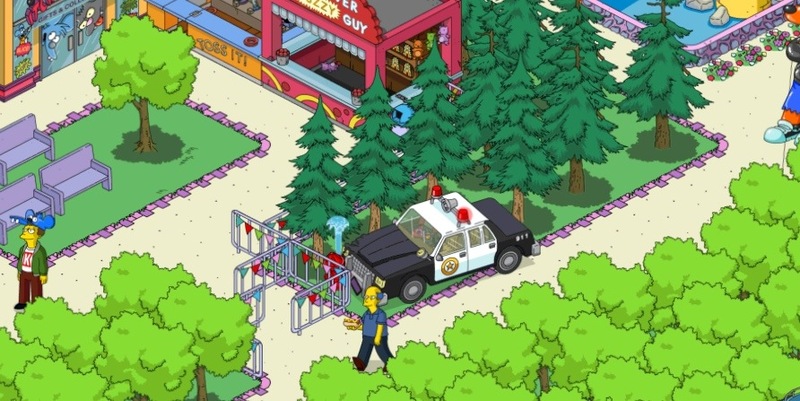 As soon as I heard Krustyland was coming to Tapped Out I was overjoyed with excitement and blocked myself from the outside world and waited for the arrival of Krustyland. The day Krustyland was released I was amazed! I was loving every aspect of Krustyland and with a boatload of donuts, I spent all night developing my Krustyland. However, I began to get bored of Krustyland soon after as it became to much effort and was like handling another town. My favorite part of Krustyland was the Eyeballs of Death, Itchy is my favourite character and was glad there was a ride based on him. The constant animations were amazing! Krustyland began to grow on me as I could start designing more due to the space I had and I was able to develop some designs within Krustyland. A ride I would to see In the future of Krustyland is Sea Captain’s Quest – Time Lagoon Ride or something based on Pirates as every theme park I have visited there is always a pirate themed ride. Other rides I would like to see are Captain Dinosaur’s Pirate Rip – Off or the Dragon Boat Ride. I would love to see a BIG update added to Krustyland involving new rides and quests. Krustyland is fun. My favourite ride is the Twirl’N’Hurl! I always have Milhouse or Nelson getting brainwashed by the aliens 😊. At first I thought it was unnecessary and a chore to complete it. All those stupid tickets it required! Now I like it and the sporadic additions of rides are great, wish for more though and some new decorations. I want a real moat around my Castle, not flowers like it is now. Also, I’d like to put all event decorations in KL. Krustyland need some more love from EA, take it to a new level, add a questline, keep it alive. Designing in KL is so much easier then in SF because of the vast free space, too much free space! Need more stuff. So my favourite designs in my KL is not so much the things you buy but rather the ones I created. The Bumpercar ride, the forest, the promoes for the sites I’m a part of and my D-heart on the most expensive plot of land. Krustyland has always been a bit of a grey area for me. On the night it was released, I was eagerly waiting with my tablet, and yes, the first few quests where you are setting it up are quite fun, but since then my activity in Krustyland has stalled to pretty much zero. It’s too time consuming to save up a load of tickets for the rides in a separate town. Krustyland promised to bring a new element to the game and after a nearly two month gap in events I was excited to learn that my crowded town wouldn’t just get bigger but would offer new areas. 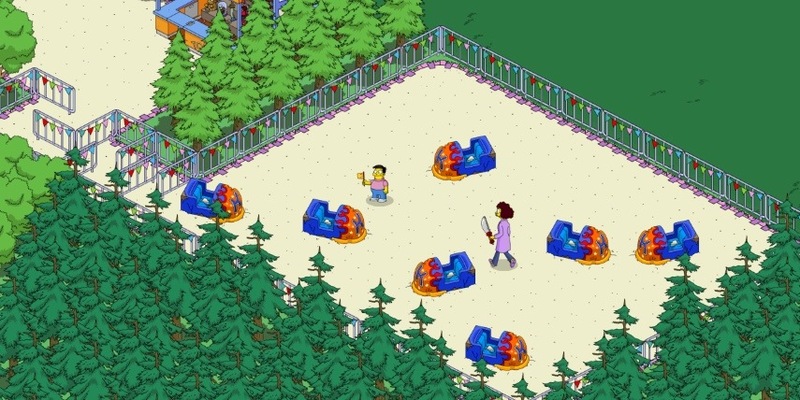 Rumors of mini games seemed to be confirmed when I placed the Sideshow You booth into my town but to my disappointment the rest of the items were just for getting tickets every few hours and while the main game became more and more crowded to the point where many of us have buildings and character in storage, Krustyland became a neglected. Last years update came out at the end of July and this one hit mid July so it is difficult if to tell if this is an annual event or just a last ditch effort to salvage the area before a Krusty related character is killed off in the season premiere but Krustyland could have been a way to add new types of gameplay but it looks like EA has decided to stick with the same model until the game suffers a farmville-esque fate. 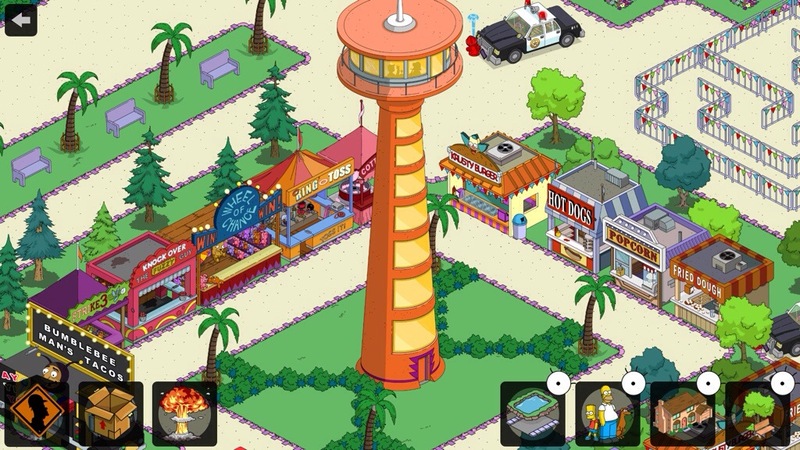 I would like to see EA use krustyland as a way to to let us play the game again instead of just collecting items when they come out and then not playing for 2 weeks because like many of you, I am becoming bored with the predictable format of these updates but there is still hope. I see only one way to fix this game, Introduce a new character into the game… you. A Krustyland only avatar of your character that can visit others KL’s to ride the rides, play the games and interact would allow EA to capitalize off of what they have already created while bringing a new level of customization and interaction and could turn Krustyland into your gateway into the simpsons world, instead of just another space in a freemium game. No matter where you are in KL, whether you rushed it or just leisurely pacing yourself, theres plenty to do in KL. Just hang in there, hopefully we see some updates soon with loads of cool rides, buildings, mascots, characters and decorations other than lv 43. How did you feel when you started KL? How did you feel before level 43 was released? Thoughts and wishlist for the future. And a link to your favourite part of your KL. I think I’d been playing for all of a week when KL was released, I was nowhere near Level 20, and saving $50,000 for the shuttle seemed impossible. Furthermore, I visited KL in Other Springfield and it just looked dumb and pointless, so I said, Screw this, I won’t bother. In late October I finished Level 35, which was the final level at the time. Then I decided on a bit of a whim to buy the shuttle. Then I got started on KL, at first going at a pretty leisurely pace, gradually picking it up. Saving tickets was so tedious, and I kept running into a bug that would periodically cause my app to crash when I touched the shuttle. I almost always got back to KL quickly enough, but I worried I’d one day strand my characters, particularly Homer and Lisa (which is what happened in those dark days after the Easter event ended). Still, I was glad I’d saved the KL quest till after I’d finished all the levels, it prolonged the excitement of having more to do that I’d gotten so used to. After I finished the main quest I went back a few times to change tickets for money; I felt a strange sort of obligation to pay back the main game for the price of the shuttle. Soon enough though I had money to spare in Springfield and started ignoring KL. Then I got the Tunnel of Love and celebrated by sending everyone who could go there for a visit. I was disappointed Marge didn’t have a quest, not even a one-time command to ride the Tunnel. 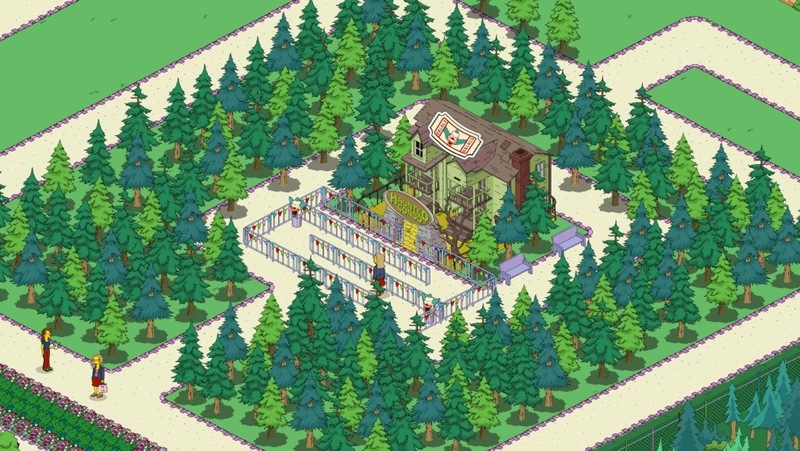 But I had everyone hanging out there just the same, and since there was literally nothing new to do in Springfield I decided I might as well buy the entire park, land-wise. That took months, with all (at the time) nineteen characters spending all their time there, minus bringing them back for new levels and events. When I finally had it all it was time to start decorating. I spread out the rides as evenly as I could and was dismayed by how much open space there was. And I only had a few options for decorations: trees, shrubs, flowers, tents, fences. I found it all so boring, but still better than empty space. Eventually I blocked out a massive rectangle in the middle of the park and spent 30,000 tickets putting in a forest involving four types of trees recurring in a diagonal stripe pattern. I guess that’s the park’s best feature, though it’s still nothing to write home about. I’m not even going to bother putting up a picture. Almost immediately after I finished decorating the park as best I could, along came Level 43. It took me by surprise. I was happy to have new attractions, though I would have liked some new decorations too (nice stuff, not stupid crap like the taco truck and Dudf topiaries). It was fun having new characters in the park and especially having the princess, but the novelty wore off, and after I finished all the Level 43 quests I finally sent everyone, including the Princess, back to Springfield. I still visit the park once a day to collect tickets from the rides, partly out of force of habit, partly because I enjoy seeing the results of the work I put into it, partly because I want to build a sizable reserve of tickets so I can hit the ground running if and when they do another big update. Bottom line, it’s not as interesting as it could be, but I’m glad it’s part of the game. Nathan your itchy design is really awesome. Good job! Your other designs are good too, all my designs end up looking mediocre. Previous How many Krustyland rides do I need to maximize the Nausea rating? Next How many restaurants & food stalls do I need to maximize the Grub rating?